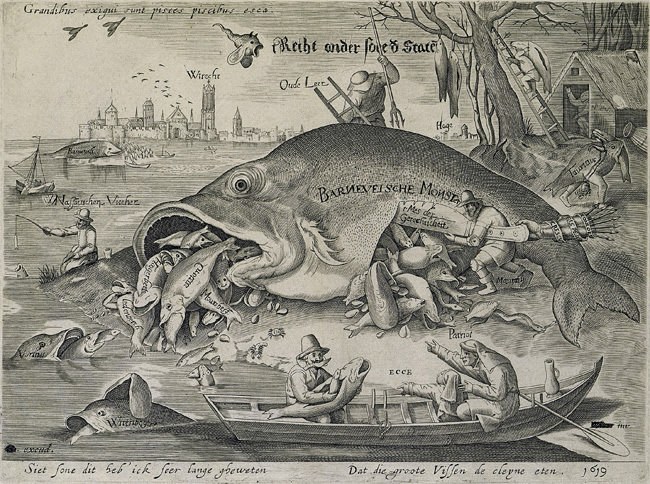 ‘The Big Fish Eat the Little Fish,’ satire on the fall of Johan van Oldenbarnevelt, 1619. 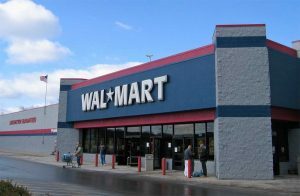 Walmart in Laredo, Texas in 2004 (Photo by Jared C. Benedict/Wikimedia). Have you driven through a small town in America recently? There are revitalization efforts in some places, but many still look like ghost towns. Vacant stores and closed businesses are everywhere. On the outskirts of town or in a nearby town, however, several Big Box chain stores have opened. Perhaps a WalMart, or a Home Depot, or a Bass Pro Shop, or a Bed Bath & Beyond, or a Best Buy. My friend and I had always felt we had a bigger responsibility to our community than BIG businesses, who need regulations to make their products and services safe for the general public. Unlike many small business owners, the CEOs of large corporations don’t live upstairs from their place of business and have to face real people every day. Small businesses give back more to communities, and have community pressure as a check and balance on their behavior. Big businesses don’t give back nearly as much and face little community pressure on their behavior. For this reason, big businesses often have less responsibility to the community and don’t seem to have any qualms whatsoever about paying people poorly or damaging the community in other ways. We hear a lot of complaints in the media about “regulation.” Yet the primary reason we have so much regulation is that we’ve seen so much consolidation. As companies have grown bigger and lost responsibility, they’ve done terrible things to hurt communities and our country. See also: the S&L crisis, Enron, financial collapse, and the housing crisis. We’ve passed more regulations because without them, these companies would simply take what they wanted and use their market leverage to give back less and less. We hear a lot that technology and innovation are the keys to our future. Technology is amazing and it’s tempting sometimes to marvel at some of our creations. But the question to ask is, how is technology being used? Is it creating better lives for people? Gig economy graphic (Mark Warner/Flickr). In reality, technology is being used to create greater returns for fewer people, privatize profits, shift risks and costs, gain more for owners, and displace people from jobs. In other words, it’s being used to make things more efficient for a few owners. This could be a good thing if people benefit from technology. By and large, however, it doesn’t look like the average person is seeing wage gains from technology. It’s the largest and most powerful businesses that can afford the investments in technology, and that reap the benefits of increased productivity. Is the average Uber driver joining the middle class? Or are they forced to join the gig economy as a second or third job just to make ends meet? 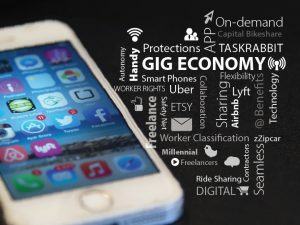 Temp, contractor, and gig jobs are the new permanent. According to an analysis from Alan Krueger and Lawrence Katz, 100 percent of job growth over the past decade came from contractor and temp jobs. With temp workers, many of the employment costs and benefits such as health care insurance, Social Security, and 401Ks disappear. The profit is privatized and the costs/risks are shifted onto temporary and contract workers. Are small businesses outsourcing workers? Maybe to some minimal extent, but not nearly as much as big businesses. It’s estimated that outsourcing to China alone cost 3.2 million jobs since 2001. How does this hurt small businesses? First, these well-paying manufacturing jobs pull money out of the economy that would otherwise have circulated to many small businesses. Over the 10-year period from 2001 to 2011, U.S. workers lost $37 billion in wages as a result of lower-paying jobs due to outsourcing. Second, globalization provides a competitive labor advantage to larger companies—one that small mom and pop businesses typically can’t compete with. It becomes very difficult for us to do economic development at the local level when our macroeconomic policies like our trade policies with China are really putting us at a severe disadvantage and sucking wages and income out of our communities. The U.S. Chamber of Commerce is the most powerful corporate special interest group in the country. Since 1998, the Chamber has spent $1.25 billion on lobbying efforts. By comparison, the next largest group, the National Association of Realtors, has spent only $363 million. The Chamber claims to represent small businesses, but by and large they represent the interests of the few legacy companies and interests that donate the most money: tobacco, oil, and banking. 2012 IRS data showed that of $164 million in donations in 2012, more than half of this amount came from just 64 donors. This may be the reason the Chamber lobbies against climate change, despite 64 percent of small business owners believing more regulation is needed to reduce carbon emissions. What are the two issues the Chamber promotes most? You guessed it: tax cuts/loopholes and deregulation. Corporate special interest groups like the U.S. Chamber of Commerce will tell us that regulations and taxes are hurting small businesses. They tell us this because they want more power, more profits, and less responsibility. They want more “freedom” to generate higher returns while paying back less to communities and people. They act in their own interests to privatize the profit and shift the costs and the risks onto average people. This is why we’re seeing greater and greater wealth inequality. The corporate special interest group story succeeds in part because it has a kernel of truth to it. Our tax code is rigged so our biggest and most successful businesses pay the least, because they’re able to take advantage of loopholes written for them. Similarly, corporate special interests often lobby for regulations that favor large corporations—they have a large cost of compliance that creates barriers in the market for smaller businesses. In order for change to happen, however, we have to recognize that this is being done by special interest group lobbyists purchasing government and actively working to hurt small business. According to a recent Gallup poll, entrepreneurial startups in the U.S. have been declining since the 1970s when they peaked at a 16.5 percent annual increase. Following the 2008 financial collapse, for the first time the number of small business failures was greater than the number of business startups. 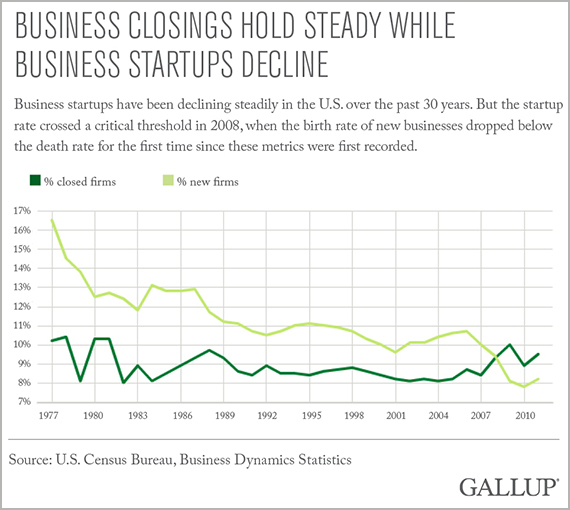 The birth and death rates of American businesses (Gallup/U.S. Census Bureau/Business Dynamics Statistics). In order for this to change, we have to first change the story. Right now the only story that exists in the popular imagination is the corporate special interest version about how taxes and regulation are hurting small businesses. But this is only a small part of the much larger story: Big businesses are hurting small businesses.